The boss of the Greene King brewery could have his effigy burnt with that of Guy Fawkes this Saturday as a row with drinkers in Sussex escalates. Lewes Arms regular are campaigning against the Suffolk-based brewery, which wants to withdraw locally-brewed Harveys Best Bitter from the pub. They have been backed by the mayor of the town and local MP Norman Baker. 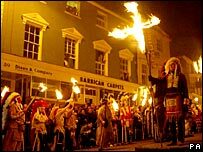 Lewes' famous bonfire societies are now set to lend their support and give Greene King a roasting on 4 November. Such a gesture would be in keeping with the traditions of the quirky 220-year-old pub, which has built up a reputation for hosting activities including the Annual World Pea-Throwing Championship and Dwyle Flunking, a traditional game involving two teams, a broom stick, a chamber pot and a beer-soaked rag. Their ire was first raised at the beginning of October when the pub informed them that Harveys would be withdrawn by the end of the year. "It was only a month ago, but the campaign got going very quickly," said Jack Wilkinson, a regular at the Lewes Arms. A pressure group, the Friends of the Lewes Arms, has written to Greene King and Harveys trying to arrange some form of compromise agreement that might see its favourite real ale kept on tap. Previously, Greene King has held firm, saying it wants "to serve our own award-winning quality ales in our own pubs". However, the drinks distributor supplying the Lewes Arms said it hadn't received any instructions to stop delivering Harveys Best Bitter and Greene King has now said it is preparing a new statement on the issue.